Confession: I don’t believe Melissa and I have ever bought a Jiffy product. When we make biscuits or muffins or what have you, we mostly make them from scratch. 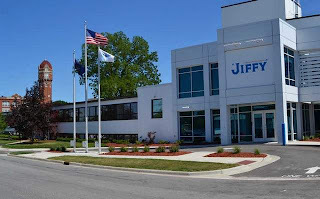 It will be claimed, with much justice, that Jiffy is able to be what it is because it fully embraces, and benefits from, a mass-market ideology and style of dumbed-down cooking and eating as old as the postwar flight to the suburbs. To which I can only respond 1) yes, that’s right, and 2) if I had to choose between a thoroughly late-1940s-style corporation, one that contented itself with a stable workplace and a supportive community while producing an honest product, and one which, on the other hand, completely embraced the high finance and out-sourcing stratagems of 21st-century capitalism, and while so doing was able to provide me with slightly better quality blueberries in my muffin mix….I’d still choose the former. Anyway, as the kids used to say back when the internet was young, read the whole thing. Just about everything you say in paragraph 1 is true of the biggest corporation of them all, the U.S. Government. Talk about expand or die. Even slowing down the rate of expansion a bit is viewed as death, to judge by the anti-sequester rhetoric. And the use of misleading advertising to expand its market share describes the Obamacare campaign exactly. 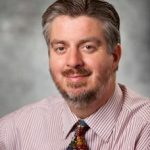 Maybe we would get small operations like Jiffy to be content with a more static role in society if we could figure out how to do the same with our government corporations. My brothers and I grew up on Jiffy mix—corn muffins for dinner and artificial, imitation blueberry pancakes for breakfast (especially when camping). The number one reason I still eat Jiffy mix today? It tastes like childhood. Number two: Jiffy is a Michigan company, which makes them local, or at least in-state, for me. Unless the nature and benefits of the merchandise or service are esoteric (as they might be with insurance or investment funds), you really cannot pull this on one household too many times. If your business has a high profile, you poison the well. Shlitz beer was produced by a big honkin’ brewer, once upon a time. Had you considered comparing the wages not to what prevails in Vancouver but what prevails in the agricultural and service sector where these manufacturing plants are founded?